Start by heating your grill to medium high. While it’s heating, halve some new potatoes (about 1- 1½ pounds), place them in a pan of cold water and bring them to a boil. Boil for 10 minutes. Tip: Starting your potatoes in cold water helps to ensure they heat and cook evenly all the way through. Drain and toss your potatoes with olive oil, salt and pepper. Place the potatoes on the grill and cook on each side for 2 minutes, until you get nice grill marks. Add bacon onto a piece of foil on the grill and cook for 18-20 minutes, until crispy. Remove from grill, place on a paper towel for a few minutes to soak up any excess grease, then chop or crumble the bacon. 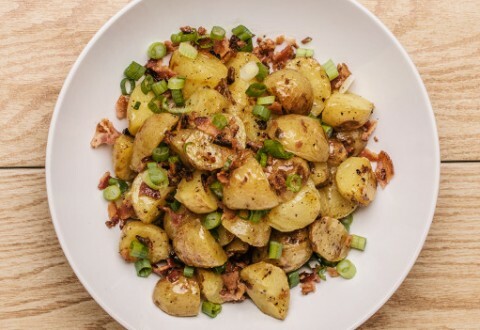 In a large serving bowl, combine grilled potatoes, crumbled bacon and a couple of handfuls of chopped green onions. Top with Lunds & Byerlys Smokehouse Cider Dressing – a customer favorite from our Deli Salad Bar, now available in our produce department. Gently toss to coat. Season with salt and pepper to taste.